Being a postmaster during that time does not seem like it would have been a treasonous act to us today, but back then being a postmaster was viewed as an act of rebellion towards the Union and these postmasters allegedly supported the Confederate cause. (A Nation Divided, NPM) Postmasters were not included in the general amnesty mainly because having a job like this a person could control one of the most important aspects of war- communication. J.J. Ward, Amnesty Petition, August 3, 1865, Case Files of Applications from Former Confederates for Presidential Pardons (â€œAmnesty Papersâ€), 1865-67, Records of the Adjutant Generalâ€™s Office, 1780s-1917, Record Group 94, Publication M1003, National Archives, Washington, D.C. 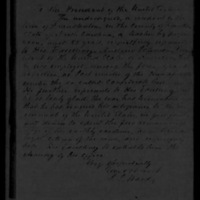 The undersigned, a resident of the town of Franklinton, in the county of Franklin, state of North Carolina, a teacher by profession, aged 58 years, respectfully requests to His Excellency, Andrew Johnson, President of the United States of America, that he was employed during the four years of rebellion, as post master of the [BLANK] afraid, under the so-called Confederate Government. He further represents to His Excellency that he is truly glad the war has terminated that he has renewed his allegiance to the Government of the United States, in good faith and desires to spend the few remaining days of his earthly existence, as a free and loyal citizen of the same, and respectfully begs His Excellency to extend to him the [courtesy?] of his office. Case Files of Applications from Former Confederates for Presidential Pardons ("Amnesty Papers"), 1865-1867. National Archives and Record Service. M1003. 1977. Ward, J.J. Amnesty Petition, August 3, 1865. Case Files of Applications from Former Confederates for Presidential Pardons ("Amnesty Papers"), 1865-67; Records of the Adjutant General's Office, 1780s-1917, Record Group 94; Publication M1003, National Archives, Washington, D.C.
Ward, J.J. , Amnesty Petition of J.J. Ward, August 3, 1865, Civil War Era NC, accessed April 24, 2019, https://cwnc.omeka.chass.ncsu.edu/items/show/863.